This guide describes the creation and generation of a CIM compliant XML Schema. Enter a unique name for this CIM schema (message). Select the Common Information Model. Drag the initial CIM Class(es) into the Class window that best represents the message. Set root elements appropriately using the context menu. If you wish to compose this type using inheritance, select a single ancestor from the inheritance list. 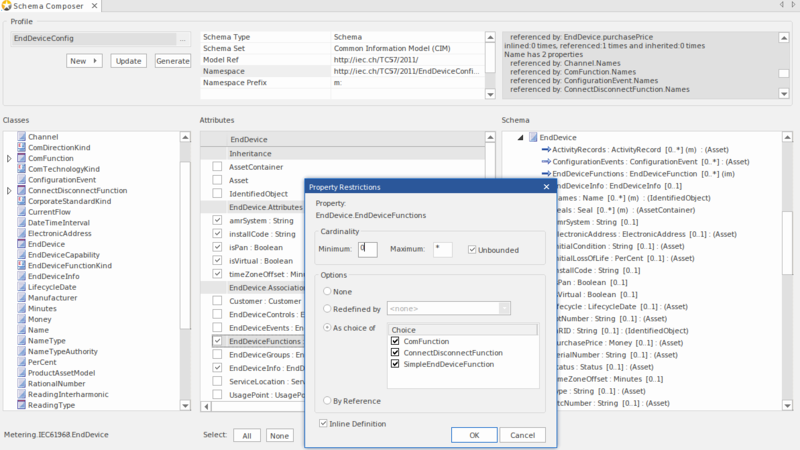 Use the checkboxes on the attributes of each class to define the set of properties that will describe this message or schema. Apply restrictions to elements using the context menu on the property. Click update to save the message. Click the Generate button and choose the schema formats you wish to export.